Economic productivity advocates ARE housing advocates. Investments in affordable housing are a proven catalyst for economic growth, job creation, and development. According to a literature review by The Center for Housing Policy, the creation of affordable housing increases employment (direct jobs such as construction and indirect jobs such as suppliers and materials); increases revenue for local government (permits, fees, property taxes, sales tax); and increases consumer spending in the area once the home are occupied (retail, grocery, etc.). (Center for Housing Policy, 2011; National Association of Home Builders, 2015). According to the Center for Community Change, every dollar invested in city housing trust funds leverages an average of $6.50 in public and private funds. An analysis by CivicEconomics and HousingWorks Austin looked at the economic effect of the City of Austin’s 2006 affordable housing bonds. 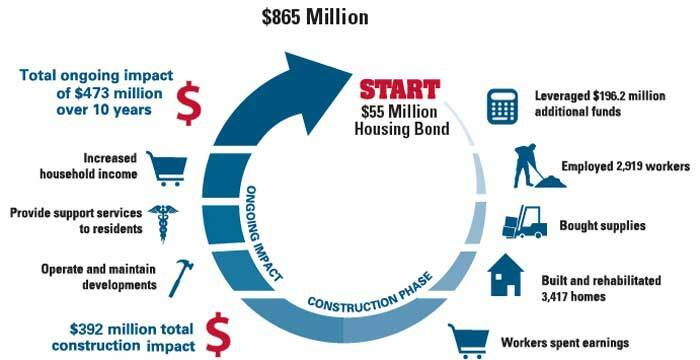 They found that the initial $55 million in bonds brought $865 million to the local economy. Retrieved from NLIHC, A Place to Call Home.